So I posted the sad “before” shots of the living and dining room here. Below are a few in progress shots. We painted everything (trim, walls, and ceiling) white for a clean, bright look. The whole house (except for one half bath) is white. We wanted it to look like an art gallery–the white really helps reflect light and makes a good backdrop for our artwork. There’s my dad and grandpa hard at work! These two rooms required the LEAST amount of work. In addition to painting, we replaced window coverings and the light fixture and had the fireplace insert removed (under duress) and installed new fireplace doors. My dad used the window coverings that came with the house as drop cloths! which was an interesting contrast with the mayhem! Thrifty decor: My grandmother sewed the curtains for the whole house. I picked a creamy sheer drapery fabric with a subtle square pattern for the living and dining rooms. Most of the pillows are silk and purchased from HomeSense, but the brown print pillows were sewn by my mom! The vintage teak side tables were purchased at an estate sale for $20, but I need to give them some TLC. The vintage Lotte lamps were a steal at an antique show, but unfortunately their original shades had been lost. One problem: our sofa and ottoman (both from The Brick) have begun to crackle and our warranty won’t cover it. Sigh. We’ve waffled about just keeping it or buying a new one and I finally imagined a sofa so wonderful that it couldn’t exist. 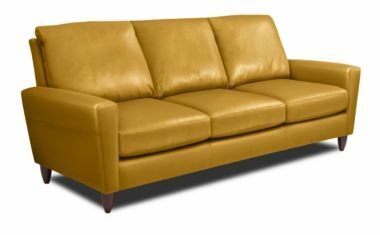 I decided if we find that imaginary sofa–vintage styling, mustard or cinnamon coloured leather–(knowing we won’t) we’d buy it. Wouldn’t you know I found it? It is made by American Leather and looks so gorgeous. But we weren’t planning on buying a new sofa and it would be a pretty big splurge so thus it is kind of a moot point. But I can pine (and save!) . . .
My grandather-in-law is an artist. He gave us these two paintings of his as a wedding present! This plant stand was built by my grandfather, an artist and welder. Work in progress: We still have to remove the non-functioning thermostat and then fill the hole. I have more artwork I am itching to hang in that spot!